Janelia Farm, the research campus of the Howard Hughes Medical Institute, is situated on 689 acres above the Potomac River in Ashburn, Virginia. The complex includes a main building about a thousand feet long (left), and a 100-room hotel (right) for conference visitors, as well as long-term housing (not shown). Great scientific research organizations, of the rare variety that produce multiple Nobel Prize-caliber breakthroughs, share common traits that can be imitated. This is the precept behind the creation of Janelia Farm, the new biological-research campus of the Howard Hughes Medical Institute (HHMI). In November, scientists from the Harvard Stem Cell Institute visited the new campus, where everything from architecture to organization to social culture has been planned to nurture an optimal environment for scientific discovery. What the visitors saw may offer ideas for Harvard, which is planning an ambitious science-research campus in Allston and working to ensure that the organizational structure of the sciences, as well as the architecture of new buildings, will promote a culture of interdisciplinary collaboration. In creating Janelia Farm, the planners relied heavily on historical precedent. “Every idea we have here, I can tell you who we stole it from,” says molecular biologist Gerald M. Rubin, the director of the facility, with a laugh. A former Howard Hughes investigator himself, Rubin has been involved since 2000 in planning the new campus (pronounced ja-NEE-lia, it is named for a former estate). HHMI, which has a $16-billion endowment, already provides $470 million a year to more than 300 top scientists at universities and research institutions throughout the country as part of its investigator program. Janelia Farm, with an annual budget of $80 million, was created to fill a perceived gap in the spectrum of research taking place in the United States. As Rubin wrote in the journal Cell, the domestic research portfolio has “shifted too far to the conservative.” Largely missing, he feels, are research organizations equipped to tackle extremely difficult problems in biology that may require long-term interdisciplinary collaborations to solve—perhaps 15 or 20 years, a time horizon far longer than that of any government grant. Such places did exist in the past. Both Bell Labs and the Medical Research Council Laboratory of Molecular Biology (LMB) in Cambridge, England, took a long-term approach to problem-solving, one in the physical sciences, the other in biology. Both produced results that were “offscale,” Rubin says, “even compared to the best private institutions.” Both were used as models for Janelia Farm. Common to Bell Labs and the LMB were small research groups, leaders who were active bench scientists, internal funding for research, outstanding shared support and infrastructure, limited tenure, and a culture that rewarded collegiality and cooperation. Sociological research, Rubin says, has shown that humans don’t have meaningful interactions with more than about 20 people. “If you want to have interactions between groups and every group is 20 people, well, it’s just not going to happen,” says Rubin. “It’s fundamental human nature.” Thus groups at Janelia Farm, with its goal of increasing interdisciplinary cooperation between labs, are limited to no more than six members. A recent HHMI survey of its investigators confirmed another of Rubin’s suspicions: that most university science professors burdened with the administrative responsibilities of running a lab no longer have time to experiment themselves. “You won’t find them with a pipette in their hand,” he says. At Bell Labs and the LMB, senior scientific leaders worked alongside their junior colleagues, which resulted in excellent communication, collegiality, and mentoring. Internal funding and performance evaluation are other key elements in the very best research organizations, Rubin says. The bureaucratic rules and time horizons imposed by outside grants can make interdisciplinary collaboration difficult, as does an evaluation process that doesn’t reward collaborative work. University tenure committees have traditionally had a hard time assessing someone whose primary work has been done in collaboration with others, especially across disciplines. Transparency, flexibility, and collaboration are aims of the building's design. Interior spaces (top) bring the outdoors inside. In the labs (middle), only the bollards with electrical and gas connections are fixed in position. Desks and benches can easily be reconfigured. The cafeteria brings researchers together at mealtimes. The result is very unlike a university research environment—as it was meant to be. Rubin says the aim was to create a unique place. In fact, his “nightmare failure scenario” would be hearing someone comment, in 20 years’ time, that HHMI had created another Whitehead or Salk Institute. Those freestanding research institutes are “best of class of their kind,” says Rubin, but HHMI already funds scientists at both those institutions through its investigator program. Instead of spending $500 million to build Janelia Farm, “we could have funded another dozen people, if that was what we were trying to do.” With the express aim of “funding science the way venture capitalists fund companies,” as Rubin puts it, Janelia Farm is explicitly not a mainstream scientific model. Harvard, which will submit its institutional master plan for a new Allston campus in early January (see "Allston Plan Imminent"), is poised to make major investments in science. A building complex to house the Harvard Stem Cell Institute and other initiatives is already in design, and several million additional square feet of academic science development is contemplated. In addition, a University planning committee for science and engineering has been meeting for the past year to devise organizational changes that might strengthen science across the University. Centralizing scientific appointments and creating incentives for interdisciplinary collaboration are among the group’s priorities. At the same time, the Division of Engineering and Applied Sciences (DEAS) has grown rapidly while sustaining an unusual, nondepartmental administrative structure, thought to be a key to its success at fostering interdisciplinary collaboration within the physical sciences. Because the primary building material at Janelia Farm is glass, there is a strong sense of connection with nature and its cycles nearly everywhere you go. Group leader Karel Svoboda, Ph.D. ’94, says the building is very functional in key aspects, such as on rainy days when “the light is extraordinary. We don’t always appreciate how much of an effect good light has on us.” Many interior walls are glass as well, creating a transparency that makes it easy to find people. Not everyone would be comfortable in such an environment, Rubin acknowledges, but then he wants to hire people who are comfortable with the collaborative environment that transparent walls seek to promote. 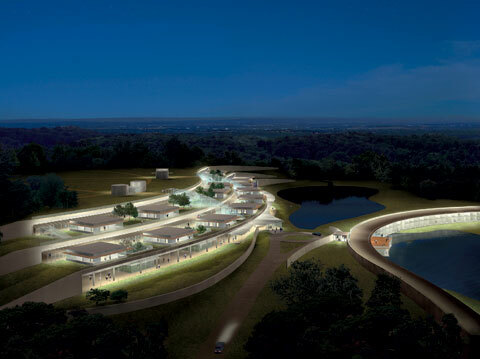 A product of collaboration between HHMI’s experienced lab designer, Robert McGhee, and the noted architect Rafael Viñoly, Janelia Farm is both avant-garde and highly functional and flexible. It had to be, says Rubin, because it was designed before its research focus—neuroprocessing and imaging—had been chosen. The lab setups can be easily reconfigured so that the physicists, computational scientists, and chemists (biologists are actually a minority) who work there can optimize their space. And the main hall in the building’s lower level is big enough to admit a tractor trailer—just in case future research demands an oversized piece of equipment.